Stone listens as the responsibilities of non-commissioned officers are read during a promotion ceremony at Travis Air Force Base, California, October 30, 2015. Following his promotion to senior airman minutes earlier, Stone was promoted to the rank of staff sergeant. 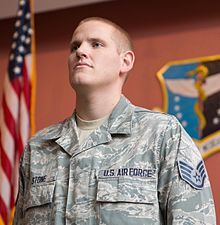 Spencer Stone ( pronunciation (help·info) born August 13, 1992) is a French-American actor, author, and former United States Air Force staff sergeant. Stone, along with fellow Americans Alek Skarlatos and Anthony Sadler, a Briton and two Frenchmen, stopped a gunman on a Paris-bound train travelling from Amsterdam via Brussels in August 2015. Gaining international fame, Stone was recognized by U.S. Ambassador to France Jane D. Hartley for "his actions in saving countless lives" and by U.S. President Barack Obama, with a ceremony held at The Pentagon to honor Stone, Skarlatos and Sadler. He was awarded the Airman's Medal and a Purple Heart. French President Francois Hollande awarded Stone, as well his friends, the Legion of Honour, the highest French order for military and civil merits. On October 8, 2015, Stone was stabbed by a California man, James Tran, 28, during a fight in downtown Sacramento. He suffered life-threatening injuries and was rushed to UC Davis Medical Center. Stone recovered, and was released from the hospital on October 15. He was promoted to senior airman in late October and then staff sergeant in November 2015. Spencer Stone was born on August 13, 1992 in Sacramento, California, United States to Brian Stone and Joyce Eskel. He has an older brother named Everett, a California Highway Patrolman in Redwood City, California, and an older sister named Kelly. Growing up in Carmichael, California, Stone met his now-best friends Alek Skarlatos and Anthony Sadler while attending Freedom Christian School in Fair Oaks, California, continuing their friendship into adulthood. All three men are described as sharing "a deeply religious background and a belief in service to their community" His mom stated that he wanted to become a soldier, watching countless Navy SEAL videos with him. Stone later attended Del Campo High School where he played football, basketball, and other contact sports. Del Campo High School teacher and basketball coach Dave Nobis, remembers Stone as he played basketball in junior year through to senior year when he was also in Nobis' psychology class. Nobis said that Stone was always looking out for family and friends, ""His blue-collar attitude and how he cared about others, he would have been the one to step up rather than curl into a ball." and that "He was always trying to pick up his teammates, giving them a high five. After he graduated, he sent me a link to a motivational speech to use in my psychology class." After high school, he enlisted in the United States Air Force. Stone worked at the Travis Air Force Base in Fairfield, California, as an intake clerk for children who needed to be treated, and trained at United States Forces Azores. João Santos, a trainer of Stone, said that he is "a really nice guy, polite, well-educated and very keen on learning." In October 2015, Stone was promoted to the rank of senior airman at Travis Air Force Base in California, due to the bold acts in France. Following this promotion, Stone was promoted to the rank of staff sergeant, effective November 1, 2016, by the order of United States Air Force Chief of Staff Gen. Mark A. Welsh III. Stone commented, saying "It is an honor to be promoted to staff sergeant, and I am extremely thankful for the opportunity to lead my fellow airmen," and that "I am ready for the growth and challenges that are ahead of me." Stone was promoted due to his role in stopping the 2015 Thalys train attack. In January 2015, Stone started education at the Airman Leadership School to learn how to be a non-commissioned officer and lead others. Stone announced in December 2015 that he would be leaving the United States Air Force in November 2016 after a meeting with U.S. Ambassador to France Jane D. Hartley further piqued his interest in international relations. He plans on pursuing a degree in international relations at the University of California, Los Angeles or the University of Southern California. Since his departure from the United States Air Force, Stone has made several public appearances. Honored at the Spike's annual 2016 Guys' Choice Awards, Stone and his friends Alek Skarlatos and Anthony Sadler accepted the hero award on June 4, 2016 from actor Clint Eastwood, sharing a conversation with him backstage. "People try and ask us what's the coolest things we've done, but I can name 100. It's hard to categorize them," Stone said. It was announced in January 2016 that Stone, Skarlatos and Sadler were working on a memoir titled The 15:17 to Paris, which would highlight the events of the 2015 Thalys train attack. Perseus Books Group, who published the book, described the memoir as "the gripping true story of a terrorist attack that would have killed more than 500 people if not for their actions, but it is also the story of three American boys, their friendship, and the values we hold dear." Jeffrey E. Stern, an international journalist, will co-write the book. David Steinberger, president and chief executive of Perseus Books Group, said that he is "confident that this is going to be a film. It's extremely cinematic, and there's a lot of interest in the movie." He further said that "based on the material, that this was going to be an important book and one that readers were really going to respond to." The memoir was made available to the public on August 23, 2016, almost a year after the 2015 Thalys train attack. In the acknowledgements, Stone stated that he "give[s] all the credit to God" and made further acknowledgement of his family, friends, the United States Air Force, the citizens of Sacramento and the United States Armed Forces. Stone, Skarlatos, and Sadler appeared on Who Wants to Be a Millionaire in October 2016 as a part of a special "Hometown Heroes" week. Playing as a team, they won $250,000. In July 2017, it was announced that Clint Eastwood would direct the upcoming biographical film titled after Stone, Skarlatos and Sadler's memoir, starring them, along with actresses Jenna Fischer and Judy Greer. Filming began on July 11, 2017. The film was released in the United States on February 9, 2018. Several ceremonies were held for Stone (and his friends) for stopping the Thalys train attack in 2015. French President François Hollande pins the Legion of Honor on Stone during a ceremony at the Élysée in Paris on August 24, 2015. On August 21, 2015, Stone and his childhood friends Alek Skarlatos and Anthony Sadler, were traveling together during a sightseeing vacation in Europe when they boarded Thalys train 9364 from Amsterdam bound to Paris via Brussels. Stone was serving at the United States Air Force 65th Air Base Group. A 25-year-old Moroccan man, Ayoub El-Khazzani, was in train car No. 12, armed with an AKM assault rifle and equipped with 270 rounds of ammunition. Several people tried to stop the gunman, but failed to do so. Sadler reported that they heard a gunshot and breaking glass behind them, seeing an employee sprint down the aisle followed by a man with an automatic rifle. Stone woke up from the breaking glass, with Skarlatos telling Stone to "go". Stone tackled the armed suspect, and was stabbed up in the neck and eyebrow and almost lost his thumb. Skarlatos took action and seized the assailant's rifle, beating him in the head with the muzzle of it until he was unconscious. Skarlatos stated that "I was thinking about survival," and "[i]t was to survive and for everybody else on the train to make it." Stone was transferred to the central hospital in Lille, France and underwent treatment in Germany, returning home September 3, 2015. After the event, Stone, Skarlatos and Sadler received international attention for their actions in preventing the attack. French president François Hollande awarded Stone, his friends Alek Skarlatos and Anthony Sadler, as well as British businessman Chris Norman, France's highest decoration, Knights of the Legion of Honour (Chevaliers de la Légion d'honneur). Hollande said the men "faced [off] with terror" and that they "gave us a lesson in courage, in will, and therefore in hope". French Interior Minister Bernard Cazeneuve praised them for their bravery, as did then-British Prime Minister David Cameron. Kevin Johnson, mayor of Sacramento, California, held a parade to honor Skarlatos, Sadler, Stone, and the victims of the September 11 attacks. Stone was awarded a United States Air Force Airman's Medal and a Purple Heart at a ceremony held at The Pentagon. On October 8, 2015, Stone was stabbed by a Californian man, James Tran, 28, during a fight in downtown Sacramento. He suffered life-threatening injuries and was rushed to UC Davis Medical Center. Stone recovered, and was released from the hospital on October 15, a week after he was stabbed. The fight broke out after a member of Tran's group used a cell phone to take video of women in Stone's group. There was an argument which subsided and the groups left separately. Tran, however, then engaged Stone again, and, "it escalated from there into a physical fight," Sacramento Police Chief Sam Somers Jr. stated. Tran then circled behind Stone and stabbed him multiple times in the back with a knife that had been concealed on Tran's person. After the stabbing, Tran and his group fled the scene in a vehicle. Stone's companions and bystanders summoned emergency services. First responders recognized the seriousness of Stone's injuries, and rushed him to University of California Davis Medical Center (UCDMC). On arrival, medical staff determined that Stone had sustained multiple life-threatening injuries, and underwent emergency open heart surgery to repair wounds to his lungs, liver, and heart. Stone recovered, and was released from UCDMC on October 15, a week after he was stabbed. Sacramento Police detectives were assigned to the case shortly after the initial stabbing. Along with video obtained of the assault, eyewitness statements, and tips from the public, detectives determined the identity of the assailant, and an arrest warrant was issued for Tran. On November 4, 2015, Tran was arrested without incident, after detectives, uniformed officers, and deputies from the Sacramento Police Department, Elk Grove Police Department, and Sacramento County Sheriff's Department conducted a traffic stop near his home in Elk Grove, California. Law enforcement officials involved in the case said that it did not appear Tran or anyone in his group knew of Stone's publicity. Officials also stated that the crime did not appear to be a retaliatory strike by a terrorist organization (either directly or indirectly) against Stone for his part in foiling a terror attack. Law enforcement officials stated that Tran has previous felony convictions, and that Tran was most likely intoxicated at the time of the assault. Stone (right) and childhood friend Alek Skarlatos (left), pictured at a ceremony in The Pentagon courtyard on September 17, 2015. Tran made his first appearance in Sacramento County Superior Court on November 6, 2015, charged of the attempted murder of Stone with an allegation of using a dangerous weapon, a knife. He did not enter a plea, was ordered to be held without bail, and was scheduled to return to court December 1, 2015. On December 1, 2015, Tran again appeared in the Sacramento Superior Court for a bail review hearing. This was subsequently postponed, with Tran held without bail. On January 7, 2016, Tran was again denied bail, and another preliminary hearing was set for February 26, 2016. At the February 26th hearing, Sacramento County Deputy District Attorney Anthony Ortiz informed Superior Court Judge Geoffrey Goodman that his department planned to amend the original criminal charges against Tran, to include gang involvement in the assault. A gang involvement charge in California provides for additional penalties if the defendant is found guilty. Judge Goodman ordered another hearing to be held on March 30, 2016, to determine whether or not prosecutors had enough evidence to proceed with the charges against Tran. Tran pleaded guilty and on May 12, 2017 was sentenced to nine years in state prison. He is currently incarcerated at Folsom State Prison. In January 2016, Stone accepted First Lady Michelle Obama's invitation to attend Barack Obama's 2016 State of the Union Address. Stone "had a heartbreaking moment" when a daughter of one of the victims of the 2015 San Bernardino attack in San Bernardino, California, thanked him for his role in stopping the Thalys train attack; Stone giving her a hug in response. Stone, in response to the State of the Union Address, said "What I will walk away with ... is how the president said we are still a strong country ... he made it clear that we aren't dealing with a giant war, but with low grade thugs," and finished by commenting "In the grand scheme, they can't bring us down." When asked which presidential candidate he supported in the 2016 United States presidential election, Stone declined to comment, wanting to maintain the public non-partisan stand of the military. Stone currently lives in Sacramento as of 2018. In 2018, Stone became a naturalized French citizen, along with friends Alek Skarlatos and Anthony Sadler. ^ Bult, Laura (19 March 2016). "Spencer Stone's father charged with insurance fraud". New York Daily News. Retrieved 10 July 2016. ^ Mai-Duc, Christine (15 October 2015). "French train attack hero Spencer Stone leaves hospital after Sacramento stabbing". Los Angeles Times. Retrieved 10 July 2016. ^ Fishel, Justin (25 August 2015). "Train Hero to Be Nominated for Air Force Medal". ABC News. Retrieved 10 July 2016. ^ Secretary of the Air Force Public Affairs (1 November 2015). "Stone promotes to senior airman, staff sergeant". U.S. Air Force. United States Armed Forces. Retrieved 5 June 2016. ^ a b c "Obama lauds 'train heroes' at White House". Yahoo! News. Washington, DC. 17 September 2015. Retrieved 5 June 2016. ^ Bruton, F. Brinley (24 August 2015). "American Train Heroes Awarded France's Highest Honor". NBC News. Retrieved 5 June 2016. ^ a b c d e Young, Susan (8 October 2015). "'Captain America' Spencer Stone Lived up to His Nickname During Paris Train Attack: 'This Is What Courage Looks Like'". People. Retrieved 5 June 2016. ^ a b Crilly, Bob (22 August 2015). 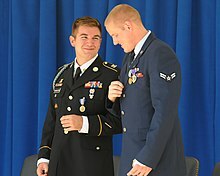 "Spencer Stone: train hero had always wanted to join the military". The Daily Telegraph. New York. Retrieved 5 June 2016. ^ a b Sangree, Hudson (23 August 2015). "Carmichael childhood, faith unite friends who stopped train attack". The Sacramento Bee. Retrieved 5 June 2016. ^ Brow, Jason (8 October 2015). "Spencer Stone - Celebrity Profile". Hollywood Life. Retrieved 5 June 2016. ^ Losey, Stephen (23 December 2015). "Train hero Staff Sgt. Spencer Stone to leave Air Force in 2016". Air Force Times. Retrieved 6 June 2016. ^ a b c Petit, Stephanie (5 June 2016). "American Heroes Alek Skarlatos and Spencer Stone Talk About Life After Stopping Train Attack: 'I Had No Idea I Had That in Me'". People. Retrieved 6 June 2016. ^ a b c d Charles, Ron (20 January 2016). "They saved a train from a terrorist attack; now they have a book deal". The Washington Post. Retrieved 9 June 2016. ^ "Anticipation grows for 'The 15:17 To Paris,' by Sacramento train heroes". The Sacramento Bee. 19 August 2016. Retrieved 5 September 2016. ^ Sadler, Anthony; Skarlatos, Alek; Stone, Spencer; Stern, Jeffrey (23 August 2016). The 15:17 to Paris: The True Story of a Terrorist, a Train, and Three American Heroes. PublicAffairs. p. 231. ISBN 9781610397339. Retrieved 5 September 2016. ^ Fletcher, Ed (28 October 2016). "Millions await French train heroes". The Sacramento Bee. Retrieved 30 October 2016. ^ a b Barrett, David. "Revealed: The mystery man who tackled AK-47 assault rifle from train gunman". The Daily Telegraph. Retrieved 5 June 2016. ^ Gary, Melissa; Meilhan, Pierre (22 August 2015). "French train suspect carried two guns, lots of ammo". CNN. Retrieved 5 June 2016. ^ a b Trayner, David (23 August 2015). "Heroic airman on France train was napping when gunman attacked". The Independent. Retrieved 5 June 2016. ^ Parry, Hannah (7 December 2015). "American hero in Paris train attack says it was 'team effort'". Mail Online. Retrieved 5 June 2016. ^ Nossiter, Adam (22 August 2015). "A Shot, a Glimpse of an AK-47, and U.S. Servicemen Pounced on Gunman on Train to France". The New York Times. Retrieved 5 June 2016. ^ "French train attack hero Spencer Stone returns to U.S." New York Daily News. Retrieved 5 June 2016. ^ a b Chrisafis, Angelique; Kassam, Ashifa (24 August 2015). "French train attack men receive Légion d'honneur for 'preventing massacre'". The Guardian. Retrieved 5 June 2016. ^ "France train shooting: Hollande thanks 'heroes' who foiled gunman". BBC News. 22 August 2015. Retrieved 5 June 2016. ^ Ellis, Ralph; King, Jessica; Dailey, Peter; Seshadri, Archith. "2 U.S. service members overpower attacker on train in Belgium". CNN. Retrieved 5 June 2016. ^ Karimi, Faith (23 August 2015). "Train shooting heroes: The men who helped avert a massacre in Europe". CNN. Retrieved 5 June 2016. ^ "Defense Officials Praise Troops". U.S. DEPARTMENT OF DEFENSE. Washington, DC. Retrieved 5 June 2016. ^ Ortiz, Gamaliel (3 September 2015). "Mayor releases details for parade honoring Sacramento heroes". KCRA. Retrieved 5 June 2016. ^ a b c d e f Helsel, Phil; Blankstein, Andrew (4 November 2015). "Arrest Made in Stabbing of Train-Attack Hero Spencer Stone". NBC News. Retrieved 5 June 2016. ^ "Sacramento police arrest suspect in stabbing of Spencer Stone". Los Angeles Times. Retrieved 5 June 2016. ^ Adams, Char (5 November 2015). "Alleged Gang Member Arrested for Alleged Attempted Murder of French Train Attack Hero Spencer Stone". People. Retrieved 5 June 2016. ^ Smith, Darrell; Sangree, Hudson. "Man accused of stabbing French train hero Spencer Stone arraigned". The Sacramento Bee. Retrieved 5 June 2016. ^ Smith, Darrell (1 December 2015). "January court date for man in Spencer Stone knife attack". The Sacramento Bee. Retrieved 10 July 2016. ^ Smith, Darrell (26 February 2016). "March preliminary hearing set in Spencer Stone stabbing case". The Sacramento Bee. Retrieved 10 July 2016. ^ a b c d Young, Susan (13 January 2016). "Paris Train Hero Spencer Stone Shares His 'Heartbreaking Moment' at the State of the Union Address". People. Retrieved 6 June 2016. ^ "Americans who thwarted train terror attack become French citizens". France 24. 1 February 2019. ^ Knighton, Tom (9 February 2017). "Is 'Range 15' the Least Politically Correct Movie Ever?". PJ Media. Retrieved 26 December 2017. Wikimedia Commons has media related to Spencer Stone.